Increase Real World Endurance with Training vs Working Out! Question: I walk at the gym on the treadmill three to four days a week but when I went out sledding with my kids I was exhausted. What do I need to do to get into better “real world” shape? 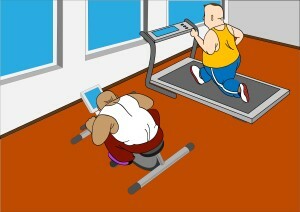 Answer: Real world shape is different than just being able to walk around the mall or on a treadmill at a low incline. If you want to challenge yourself and aren’t able to run due to your knees hurting then continue to walk. However move the incline up to the maximum level and by the way, you aren’t allowed to hold on. You don’t have to change your speed the higher incline will be enough at first. Take normal to slightly longer than normal strides. You may not be able to walk longer than fifteen minutes at first and your goal is thirty minutes. You should attempt to ignore the distractions like the televisions around you. Use music you enjoy, music that motivates you and walk for a number of songs not time. Cover the timer and use earphones to help to isolate yourself. Walk for a predetermined number of songs. If you’re walking for thirty minutes that’s approximately eight or nine songs. Check your time after those have played and see how much time you have left to complete thirty minutes. Ignoring the distractions enables you to focus on the business of training and work harder. Studies have proven that people using music instead of watching the television or trying to read while walking burn up to 22% more calories than those who do watch television while walking. It seems like a simple solution, increasing the incline, not holding on and using music but it changes working out to training and making real world changes.